Two Kohala High School students have joined the Board of Directors of North Kohala Community Resource Center as the Center enters the second year of its Youth Director Program. KHS senior Tanya Adams and junior Mary Marvelanne Clark joined the board in October. Malcolm Davis, Hawaii Preparatory Academy junior, is in his second year as a Youth Director. The purpose of this program is to support Kohala youth by providing an introduction to the nonprofit sector through our grass roots organization. While serving on the board the youth directors learn about how the Resource Center’s board and staff operate to effectively govern and manage a community organization. The youth directors attend regularly scheduled meetings, under the supervision of Director-coaches. They have the opportunity to interact with adult Directors, cast their vote on project applications and other matters, and participate in Resource Center fundraisers and other events. Other opportunities may include attending one of the Resource Center’s workshop series and making site visits to youth-oriented sponsored projects. An important outcome of this program is to “grow our own” future community leaders in Kohala by empowering our local youth. 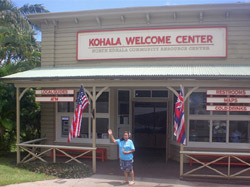 By exploring youth representation on the Board, the Resource Center is fulfilling its ongoing mission by providing both local support and education in Kohala. Youth are often an untapped resource of energy, new ideas, and insight from a community constituency that is often not heard from. The many and varied experiences available to the youth directors will provide a tremendous experience that will encourage local youth to become community leaders and continue to work and serve in their community. Register Now for the NKCRC 2019 Golf Tournament!